Like never before, you can experience the beauty and life-changing power of the Bible. Unique among audio Bible productions, The Bible Experience is a captivating performance of the Bible presented by a stellar ensemble of today's top-name actors, musicians, clergy, directors, and award-winning producers. This historic production also features a cinematic musical score, unparalleled sound design, and the highest production value. The Bible Experience is truly theater of the mind and spirit. 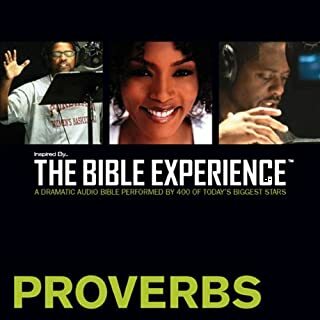 The most ambitious, critically acclaimed presentation of the Bible ever produced, TNIV, Inspired by...the Bible Experience Audio Download features a star-studded cast of almost 200 performers. Highlighting the cast is 2007 Academy Award-winning actor Forest Whitaker as the voice of Moses along with Angela Bassett (Esther), Cuba Gooding Jr. (Jonah), Denzel and Pauletta Washington (Song of Songs), LL Cool J (Samson), Eartha Kitt (Serpent), Bishop T. D. Jakes (Abraham), and Bishop Eddie L. Long (Joel), among others. Like never before, you can experience the beauty and life-changing power of the Bible. Unique among audio Bible productions, The Bible Experience is a captivating performance of the Bible presented by a stellar ensemble of today's top-name actors, musicians, clergy, directors, and award-winning producers. This historic production also features a cinematic musical score, unparalleled sound design, and the highest production values. 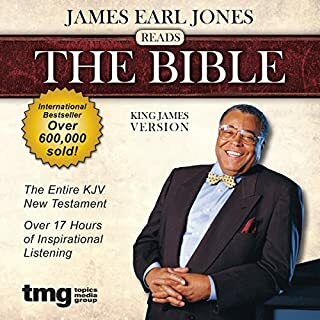 In a voice as rich as it is recognized, James Earl Jones lends his narrative talents to the King James Version of the New Testament. In over 19 hours enhanced with a complete musical score, James Earl Jones interprets the most enduring book of our time utilizing the acclaimed actor's superb storytelling and skilled characterizations. Hailed as the greatest spoken-word Bible version ever, and with almost half a million copies sold, this exquisite audio treasury is certain to enthuse and inspire. Inspired By...The Bible Experience breaks new ground in the presentation of the Bible. 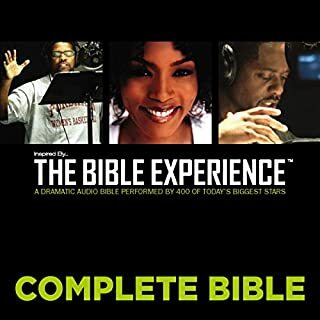 Unique among audio Bible presentations, The Bible Experience is a captivating performance of the Bible presented by a stellar ensemble of today's top-name actors, musicians, clergy, directors, and award-winning producers. Like never before, you can experience the beauty, drama, and life-changing power of the Bible. Inspired By... The Bible Experience breaks new ground in the presentation of the Bible. Unique among audio Bible productions, The Bible Experience is a captivating performance of the Bible presented by a stellar ensemble of today's top-name actors, musicians, clergy, directors, and award-winning producers. This historic production also features a cinematic musical score, unparalleled sound design, and the highest production values. A star-studded cast has been brought together for a remarkable dramatization of the entire Bible. With performances by Yolanda Adams, India.Arie, Angela Bassett, James Brown, Levar Burton, Dr. Juanita Bynum, Shirley Caesar, Nick Cannon, Common, Ruby Dee, Charles S. Dutton, Faith Evans, Kim Fields, Kirk Franklin, Tyrese Gibson, Cuba Gooding Jr., Regina Hall, Fred Hammond, Dr. Billy Ingram, Samuel L. Jackson, Bishop T. D. Jakes, Orlando Jones, Yolanda King, Boris Kodjoe, Nikki Kodjoe, Eriq LaSalle, Derek Luke, MC Lyte, Judge Greg Mathis, Donne McClurkin, Mo'Nique, Tahj Mowry, Tamera Mowry, Tia Mowry, Dwight "Heavy D" Myers, Keke Palmer, Tyler Perry, Kelly Price, Della Reese, Star Jones Reynolds, Angie Stone, Cheri Townsend, Tye Tribbett, Cicely Tyson, Blair Underwood, Denzel Washington, Forest Whitaker, Vanessa Williams, Chandra Wilson, and more. Don't miss Inspired By...The Bible Experience: New Testament. For those who would rather have the names of the books instead of the generic part 1,2,3... labels, here is the info you so you can relabel it in itunes. Also enter the numbers accordingly for each part in the disc number criteria so the books will be sorted in the proper order on your ipod/iphone. If you could sum up Inspired By...The Bible Experience in three words, what would they be? I most appreciated the engaging narrative. If you ever wondered how you could get through 2-3 more chapters, this rendition is for you! First of all, chapter numbers are not read. I got lost in the narration, and had to pull myself away after about ten chapters. It's like listening to a movie complete with sound effects, and music that adds to the atmosphere. This recording even makes Leviticus and the Geneologies come alive! From animal sounds to babies' cries, it draws you into both the dialog and the experience of the people who lived long ago. Narrators come from different racial groups which adds to the drama. It's like reading the Bible for the first time bringing freshness to dry parched souls, and music to the ears. Be prepared to laugh, and cry, and be transformed by the experience! This is a recording I will come back to again and again! Gone are the days of dry reading sessions! Thanks Zondervan, and thanks Audible! And thanks to all the people who made this recording possible! I have loved listening to the Bible Experience. It's great to listen to when you are in a place where you can not read (even better when you can follow along in your Bible). They did an excellent job. I would strongly recommend it to anyone (especially those that struggle to find time to read the Bible or have a hard time understanding it). The dramatic reading is good and has nice background sounds. However, this is not the complete Old Testament (as noted by other reviewers). I have listened to all 9 downloads. At the beginning section of one of the last ones there is also a section that is recorded over in a fast voice. Sounds like someone messed with the recording and Audible has not corrected it. I would not recommend Audibles version unless they correct these bugs. I bought this a couple of years ago. This is wonderful on my iPad as I can let it play me to sleep as it charges up. What a blessed way to end one day and prepare for the next! So...Where's the rest of it? It's Genesis through 2 Chronicles... really? The Inspired By media group is outstanding and this is a faithful presentation of my favorite book.... but not all of it is here. This should be called "Part 1" or something I downloaded this wanting ALL of what it says it is: The Old Testament. So... Isaiah... Jeremiah.... Danie... Habakkuk .... Malachi.... where's the rest of it? What disappointed you about Inspired By...The Bible Experience? The Bible Experience is wonderful. The Audible version is not so good however. 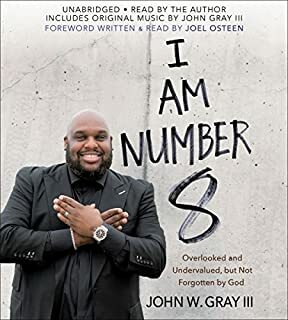 The audible version does not breakdown the tracks by Bible book therefore you can't intentionally listen to what you want when you want and when its the Bible that is important. I have no clue what verse, chapters or books I'm in. this is on going reading with no book marks. If you want to read Genesis, Exodus or Levitcus, there's no way to found them. No titles to any books on this audio. I don't have I tunes so I can't change the parts. Nineteen parts with no titles. BIG miss! First let me say that the Bible Experience is the best Audio Bible that I have ever heard. My only problem is that when I downloaded this into Windows Media Player I did not realize that it would be formatted into 9 parts, w/o books or chapters shown. Because of this you will have to forward through each part searching until you hear something that alerts you that it may be the book that you are looking for. Because I am an avid bible reader & like to read along w/the narrater this has seriously impacted my enjoyment of listening to this audio book on my computer. For those who just want to listen straight thru will enjoy this. The Inspired By Bible Experience is probably the most significant and important work ever committed to audio. This is no mere audio bible but an epic 65 hour drama: a product worthy of Hollywood. I cannot praise this work too highly. The cast are all African-Americans including the cream of the acting fraternity. I don't normally like American audio due to the all too common Texan drawl however these voices are superb. I'm waiting for Audible to release the New Testament which is already available in the shops at an exhorbitant price. The greatest audio production ever. Buy a TNIV XL 'hardcopy' and read along. I love this - it's so well produced. Well the product needs no introduction. It's the word of God after all. I have been listening to this consitently and love the change in character voices rather than one monotonous voice all the way through. There is however a lot of background noises for effect like running water or crowds murmuring as the characters speak. This was really distracting at first as I couldn't concentrate on the actual word but after half an hour or so I got used to it and could filter it out. My biggest gripe, and it really is a shame cause there has been a lot of work been put into this, is the chapters and books are not separated on the audio. In other words if you wanted to skip tracks to Chapter 12 in Genesis from Chapter 1, you can't simply select the next track to 2, 3, 4, 5..... and so on. Instead it's a laborious task of searching using fast forward which is not practical. However, if your intention is to simply listen to the audio systematically and not use it for study purposes then i can highly recommend it. If like me you are studying and want to hear specific books or chapters then it's really not properly set up for this. There is a way around it involving taking the audio and splitting it up manually but this takes me around 90mins per book and with 66 books that's a lot of time investment. Hope this helps anyone considering the purchase. I loved the narration but wish the whole book was divided into books of the bible instead of chapters, i.e chapter 1, chapter 2 etc. This makes it difficult to find the book of the bible you want to hear! I've never read through the Bible myself so taking the opportunity to listen while commuting I found to be an ideal solution. The performance was great with appropriate music and sound FX to create atmosphere throughout. I'd really recommend this to anyone who's never managed to sit down and read the Old Testament themselves and to anyone else who's looking to have it read to them and have new aspects of familiar passages revealed to them in the context they were written.